In our ongoing series about developing a quality technology plan for your business, we’ve covered a couple of important topics. 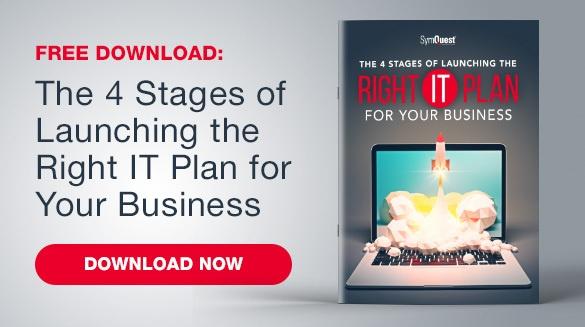 We began with 5 Essential Steps to Discover Your Business’s IT Direction, and continued with 7 Questions to Ask Before Designing Business Network Environment. The next phase, after Discover and Design, is Plan. Once you’ve identified your goals and designed an IT project for your business, such as updating network infrastructure or moving to the cloud, it can be tempting to jump in right away. After all, you’re most likely eager to solve the problem at hand as quickly as possible. But careful planning is critical for ensuring that the entire project runs smoothly, sticks to a schedule, stays on budget. It may not be the most glamorous step, but its importance can’t be overlooked! Your IT project plan needs to be documented in a way that is easily understandable and accessible for each member of the team. Whether you use third-party project management software or your own internal processes, be sure that each step of your plan is thoroughly defined in writing. IT projects can be complex with many moving parts, and it’s important to crystallize any decisions that come as a result of meetings or other communications by integrating them into the plan. 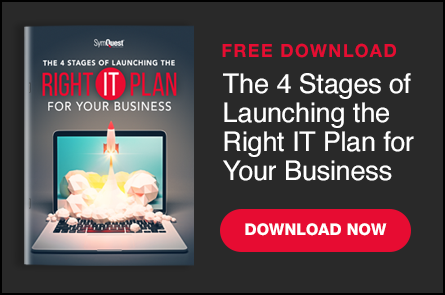 When you’re ready to draft your IT project plan, there are several crucial components you’ll need to include to make the plan as effective as possible. Here are eight pieces every business IT project plan needs to include. Project Manager: Manages the project scope, budget, communication, etc. Defining roles and responsibilities will help you avoid roadblocks. Knowing the areas each person is responsible for increases ownership and accountability. The project structure and scope is the what and the how. Document exactly what you are doing, and how it will be accomplished. This involves defining each task that will need to be completed in order to finish the project. Be sure to also include information about the scope by defining the parameters of the project. Especially if you are working with an IT vendor, it’s important to be on the same page about exactly what is and is not included in your engagement. Will this project be delivered in phases, or all at once? When will various components be released to users, if applicable? These are the areas of the project structure that it’s important to define. Blocking out the IT project into distinct phases can help maintain organization. What needs to be completed before the project can begin? What elements need to be put into place before work can start? Prerequisites may be technology-related, but not necessarily. They might be related to business processes—have we done everything we need to in order for this project to be valid? Or they may involve budgeting—do we have a procurement strategy that has received the go-ahead? Whatever your project prerequisites, now is the time to organize them into your IT project plan. Since you have already blocked out your project’s scope and structure, it’s time to fill in the deliverables. Deliverables can be thought of as distinct tasks that must be completed within the project. While each task may have associated subtasks that are part of the larger whole, the deliverable itself is a building block of the overall project. During the project, as deliverables are completed, one of the project roles will be to assess them for quality and make approvals. Be sure that one of your defined project roles is empowered to assess deliverables and decide whether they have been successfully completed. Use the various pieces of the plan you’ve already defined to build a realistic and manageable timeline. When is each phase of the project due? Within each phase, when is each deliverable due? In addition to breaking out the timeline of tasks, schedule performance check-ins and team updates to ensure that everyone is on the same page. Often, you may not find out about a roadblock until it is too late. By building progress updates into the project schedule ahead of time, the team can address challenges before they become real problems. Assemble all of the allocated resources for this project in a place where the team can easily access them. Resources will include the various tools and information needed to complete the deliverables. Clearly, business IT projects can get complex. To manage all of the moving parts, you’ll need to develop “sub-plans” that will help control all of the various aspects that must work together. Think about how you will manage each of these elements throughout the duration of the project. Remember to think about who will manage these aspects, and what tools they will use to do so. Schedule: Where will the schedule be kept, and who will update it? Procurement: How will purchases or purchase requests be made? Whoa approves them and what is the process? Cost: How will the budget be monitored and controlled? Risk: Who is responsible for risk management and how will risks be assessed and conveyed to the team? Quality Control: What is the process for assessing and measuring quality of deliverables? Communication: What methods of communication will be used and who will own each? Staffing: Who manages each of the different project roles and team members? Change: How will change requests be handled? Release: Finally, how will we orchestrate the project release? As any business person knows, projects—no matter their nature—can quickly run off course. Properly planning your business IT project will help limit project challenges while better controlling budget and timeline. If planning your IT project on your own seems overwhelming, contact SymQuest to get in touch with a business IT expert who can guide you through the process. We can help you design and plan a project that works for your business and helps you meet your goals.